A couple hours or days after last issue (x-men #70) finds the beautiful Jean Grey levitating telekinetically while her husband takes a nap on a small bed (Where did the bed come from you ask? Well that’s not explained but we assume a few x-men with cash made a few quick purchases). She reflects on the past year and what has happened to her friends and allies, those long gone, and how it affects those here and now. You see after what has happened she and her husband Scott Summers and Jean decide to take a leave of absence from the X-Men (about damn time!) so Scott can recuperate from his injuries (yeah that nasty bomb operation last issue (x-men #70) really can put a guys life in perspective). Jean decides to use her final day to telepathically erase all traces of Bastion from the mansion. Iceman takes Beasts girlfriend Trish (The glory hog) back to Manhattan (where she belongs), while Dr. Reyes flirts with Beast (accidentally mind you) much to her embarrassment (There is that chemistry again). Cannonball and Maggott begin to get into verbal sparring which result from Sam being so “proper” and Maggott trying too hard with the ladies (a budding bromance is born). Jean finds Storm and Wolverine in the stables, digging up Storm’s buried treasure: her old gold coins (no doubt from her thief years) , tiara (Goddess years) and lock picks (obvious). Storm tries her best to reassures Wolverine that their guests will be fine in the mansion (she even thinks they should roll out the welcome mat) but Wolverine ( the little pip) hits a raw nerve when he mentions how she don’t turn the other cheek for Marrow. This upsets her but Wolverine assures her he has her back no matter what. Just then Sam walks in, he’s playing welcome wagon and is carrying two of their guests into town for a little sightseeing and coffee (because Dr. Reyes smash when she have no coffee). He invites the veterans along when Marrow comes in and proceeds to piss storm off, bait her in front of the new recruits and even physically assault another before storming off. Storm can’t keep her cool and soars through the barn roof and bad weather ensues. A world away In Cairo Egypt, a man runs for his life in an airport he clutches a package for dear life. The package we learn is for mutant goddess Storm. All in hopes that she may return and save them all from Ananasi (where I come from that’s Anansi). 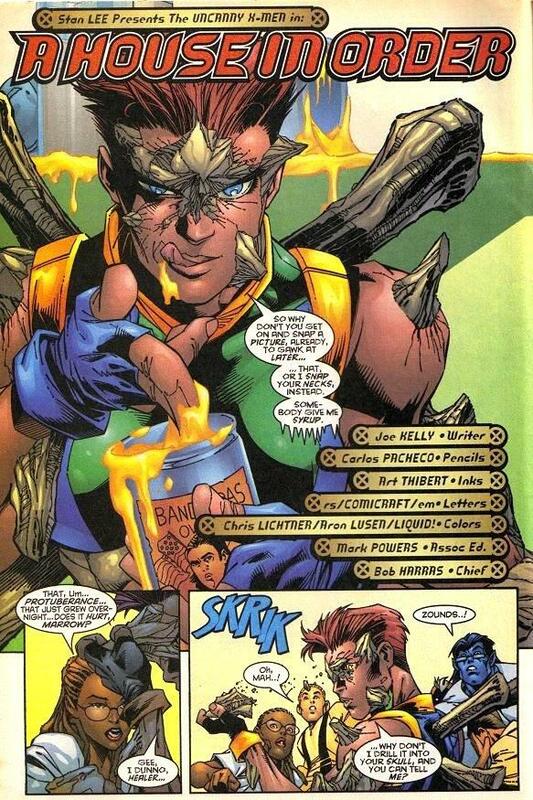 Eventually Jean, Cannonball, Maggott and Cecelia head into town to get some coffee and fresh supplies; while Scott and Wolverine discuss the fact that when Slim and Red leave things will be different, despite Wolvie putting it out their Scott still puts him in charge (Along with storm that is) until he returns. Meanwhile in Venice, Sebastian Shaw is met by a mysterious being (Looks almost like Dusk from Slingers) who manipulates time quite nicely. He hands Shaw an envelope bearing an emblem that may or may not be related to the Apocalypse. The excursion group returns to the mansion after learning that the heroes thought dead in the Onslaught crisis are actually alive and well (How disappointing). While leaving Salem Center, a homeless man is killed (sucked right out of his boots actually) and its either Marrow or some new threat afoot. Scott and Jean have a last minute discussion of if they should leave yet ultimately still decide it is for the best and leave. Wolverine then meets with Storm in the now vacant attic and he lets her know, all the new recruits are staying by order of Slim, she discusses that no garden can flourish without trimming the weeds. After this ole Wolvie heads to the basement to deal with Marrow (sweet cliffhanger ending). Joe Kelly’s wrap up of pruning his cast and writing out Cyclops and Jean is done well. He delves into Storms personality well, he actually reveals a darker side to her than any other writer up to this point. She and Marrow have genuine beef and its not going away any time soon. Marrow brings out the worst in Storm because she is the physical manifestation of her failure to lead and keep the morlocks safe. Whats more she also reminds Storm of her moment of weakness when she allowed herself to not find an alternative other then ripping a young girls heart out….Literally! Cecelia meanwhile is still very upset about being ousted and not the least bit sympathetic to the X-men’s current plight. Maggott on the other hand seems to be fitting into the team flirt more so than Gambit by making passes at the married Jean and having clashing personalities with the very “proper” Cannonball. Kelly’s team has great chemistry, and is ripe with potential story lines and Pacheco’s art is easy on the eyes. The subplot left over from the last crop of writers is the niggling Maggott situation. You see…. he called Joseph “Friend”, and he was tracking down Magneto (at this point we thought he was Joseph)+ Psylocke sensed “darkness” in his soul (although the writing at that point was……weird, where she was concerned). So in this issue Joseph finally decides that he should talk with Maggott. It seems a stretch he would wait this long…….after all this is supposed to be important. 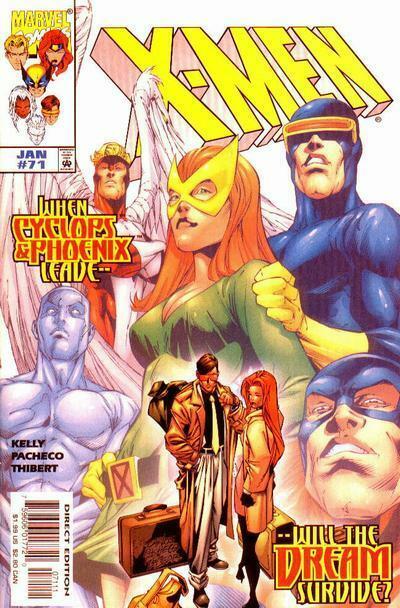 If you jumped into X-men around issue 70 though this issue has no discernible problems.